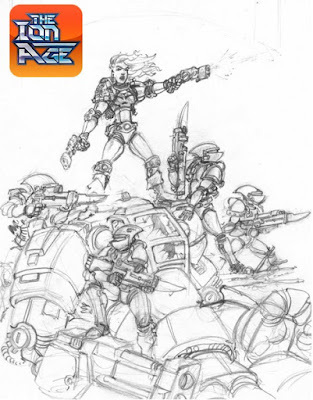 The Ion Age Blog: Patrol Angis and Callsign Taranis will be larger format books! Patrol Angis and Callsign Taranis will be larger format books! Do you like what you see? I do...and I have seen the finished art that this sketch was the beginning point for. There are great things a foot at The Ion Age. In a few weeks time we will be all about Callsign Taranis the book and the pre-order offers too. Before that we will put the new and improved production method IAF035 Adder Combat Cars (all six different models) back on the website shortly and we will tell you just what is in Callsign Taranis the expansion to Patrol Angis. But first this little article by way of introduction to what will come. Both Patrol Angis and Callsign Taranis will be published as A4 larger format books moving away from A5. We have responded to customers and shortly the smaller A5 format Patrol Angis will be removed from our website meaning that if you have one of them it will be a collectors item for there will be no more smaller format books in this growing series. If you want the smaller format book get it now as it will be removed with the pre-orders begin or sooner if stock is exhausted. Simply put I placed so much value and word count in Patrol Angis (and Callsign Taranis) that it needed more space for everyone to be able to enjoy it properly! I have shown the cover art of both books before and now I will tell you that those two great pieces of art are NO LONGER the cover art for the books. Sam Croes the lead designer and artist at The Ion Age has created two new much larger works of art for the covers. So in conclusion the existing Patrol Angis rulebook will be re-issued as a larger format with new covers but with exactly the same content and Callsign Taranis will be larger format too and will have new cover art and totally new content. Hope you liked the sketch. Go HERE for Patrol Angis on our 15mm Publications page. Thanks Zac. I am sure you will like the new book and the new format. What is in the Callsign Taranis book? First Look at the new Patrol Angis book cover!